If you have a shop or another business with direct access to the public, tempting people inside is vital. Business owners often turn to signs and displays to encourage people into their establishment. However, your use of signs shouldn’t end at the door. They can also be extremely useful inside, for a variety of purposes. From leading customers around the store to promoting offers, signs and displays can help. When you think about how to advertise your business, don’t forget to consider these tips for effective signage. One of the best ways to use signs and displays is for bringing customers inside. You can use them in your windows, as well as directly on the pavement outside your door. As people walk past, you want something that will catch their eye and hold their attention. It needs to intrigue them enough to tempt them through the door. Some of Assigns most popular signs for using outside include chalkboard displays and A-boards. You can use them to promote special offers and advertise products and menus. You can even just write something funny. 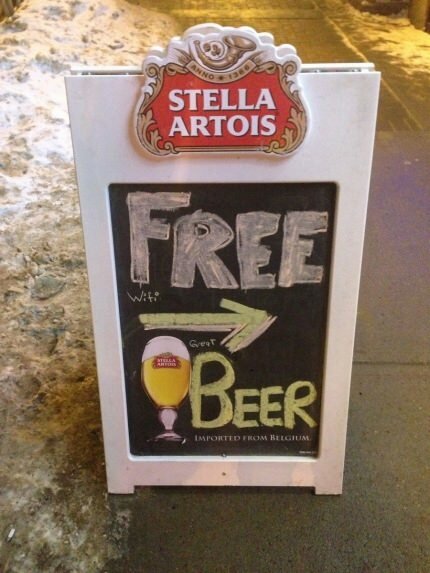 Our pavement signs are excellent for this purpose too. Once you’ve tempted your customers inside, you need to encourage them to spend. 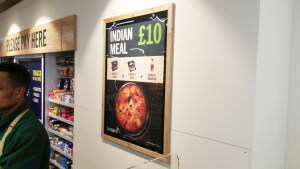 Our poster frames, banners and digital displays are ideal for in-store advertising. You can use posters and displays to promote new products or special offers. The key to using signs indoors is to put them in the right place. You can even do some research on the psychology of walking through a store or alternatively spend the afternoon in Ikea who have mastered the art of using internal signage to guide visitors on their journey around the store and draw attention to certain products. There are certain places people will be drawn to first and ideal paths to lead them on to that can increase your chances of a sale. Your customers may have come in for something specific and collected what they want. But you can have more success if you encourage them to go further. Whether you have a shop or a cafe, you can use signs to upsell your products. These can be most effective when your customers reach the till. They have just a short time to make a quick decision and decide if they want to make their purchase bigger and better. You can also use them to encourage cross-selling. This involves getting them to add another item to what they’re buying. Signs and displays are excellent for engaging customers too. Our digital signage is ideal for this purpose. The light and movement of an LCD display or an LED light box makes your sign that much more intriguing. You can use these displays to encourage customers to visit your social media pages. Include your website URL and email too and you further increase your chances of additional purposes or opportunities to market to them at a later date. They’re also excellent for displaying customer content, perhaps that they have sent to you via social media or in a competition. In fact, having a touch screen display allows you to have a game or competition in your store. Anyone who wants to know how to advertise your business needn’t look further than signs and displays. They’re perfect for using inside your shop, as well as outside and can play an instrumental role in increasing awareness, footfall in store and encouraging customers to spend that little bit extra.